We carry many wonderful, natural products—including traditional Chinese herbal formulas. A chiropractic adjustment is the most effective way to fine-tune your Master System: the nerve system. Your entire life experience is processed through your spinal nerves and brain; any misalignment in your spine will distort your life experience. A chiropractic adjustment is the freeing up of the natural free flow of life experience to and from your brain. Not only is pain lessened, but life is richer and more complete. In this treatment, Dr. Olson will strategically place extremely thin needles into specific points of your body. The stimulation of these miraculous pressure points will help your body to balance its vital life energy. After the needles are placed, you will comfortably relax in one of our soothing treatment rooms for 15 minutes of energetic rejuvenation. This is an aspect of acupuncture that adds heat to a needle or an acupuncture point. The heat is a byproduct of the burning of an herb called mugwort over the point or on the needle. We find moxibustion to be very helpful for cases of osteoarthritis, pain, or weakness. 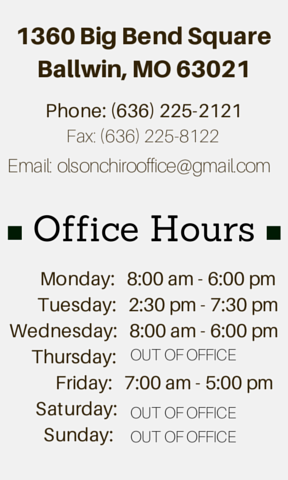 Dr. Olson has been using Chinese herbs in his practice for over 20 years. He studied for twelve years with Master Guo, a sixth-generation Traditional Chinese Herbal practitioner. Traditional Chinese Herbs are the greatest, most intricate system of natural medicines in the world. Many conditions are best remedied through a personalized herbal approach. The power in Traditional Chinese Herbal Medicine is that it changes the condition from a diseased state to one of health. Once the condition is changed, you will no longer need to take the herbs. In this session, Dr. Olson will assess your individual metabolic type, and give advice to help balance your nutritional needs. Food can be a healing remedy or a cause of the most troublesome health problems. Before you use drugs, herbs or other heroic options, balance your lifestyle to help heal the body. Dr. Olson will assess your individual nutritional needs, evaluate your current nutritional program and help to plan a personalized supplemental regimen so that you can be sure you are getting the most out of taking nutritional supplements. An excellent approach for almost any autoimmune problem. By focusing on the cause of the problem, this technique allows long-term healing to occur. Arthritis, Thyroiditis, Lymes, Chronic Fatigue, Fibromyalgia, Multiple Sclerosis, and other conditions have all responded well. Help detoxify your body with a series of 30-minute footbaths. Your feet will be submerged in a tub of warm water with an ionizing module that acts as a magnet to pull impurities out of your body, through your feet. Patients have reported decreased joint pain, improved quality of sleep, greater sense of well-being, return of mental acuity, and many other benefits as the footbath removes harmful toxins and balances the body’s energy. If you feel as though you need extra time during your visit to discuss certain life occurrences or stresses with the doctor, you are more than welcome to schedule a coaching session. The doctor assists you with getting your feet back on the ground, processing tough decisions, opening you up to new perspectives, or helping challenge you to think more deeply as you progress through life’s events.